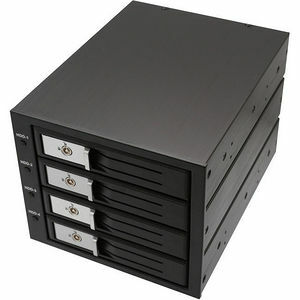 The SY-MRA35030 is a 3.5" 4-Bay SATA/SAS HDD Internal Enclosure that can take 3x 5.25" Slots. Support up to 6GB/s, has a built-in 8x8 cm Fan, Intelligent Fan Controller with Alarm Setting at 55/60/65°C. Can support 50000 times Hot Swap. Enclosed in a Aluminum Casing with Key Lock.